It’s been one month today – since I stepped out onto the ice runway at McMurdo and into this crazy world of Antarctic life. Seems like a lifetime, and still I feel like a kid in a candy shop. On the moon. A bit busy today, so this is going to be a short and scattered post. Main attraction today is photos of the fabled ice tunnels, over at http://picasaweb.google.com/david.cohn/20101130IceTunnel. I managed to skip out on my official duties for an hour to tag along with Renee, the winter site manager, on her morning rounds to check up on the rodwells. Coldest constant temperature on the planet, I think. Some crazy stuff entombed down there in little alcoves carved out by old Polies. You need special permission to go in, so it was a treat to get to follow Renee and get the nickel tour. 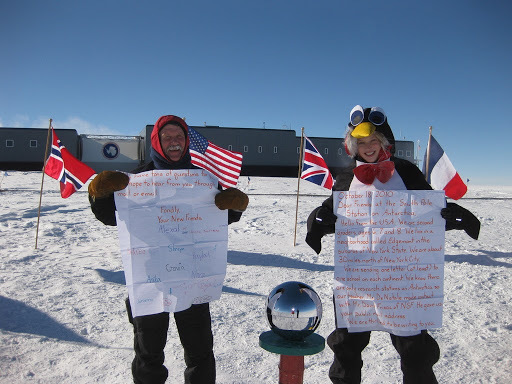 with a letter sent to the South Pole by a middle school in NY. In other news: got the “other side of the story” in a great post by one of the DC-8 scientists from a couple of weeks back, over at http://www.lablit.com/article/634. I’ve built up a few bits of writing I haven’t posted yet, and will probably put them up over the next few days, but I think I’m going to try to take a bit of a break from posting every day, and focus on trying to do some non-blog writing. Yeah, I’ve got an idea for a story, and I want to try to start writing it. So the blog is going to become a little more sporadic, but hopefully more meaty. Boo! I've been having so much fun reading new posts every morning. Have fun with the other writing, but don't forget us!